Since lately I’ve been drinking more water and smoothies/juices made in my new Vitamix, I’ve developed an increased need for insulated, no-spill bottles to tote around during my day. 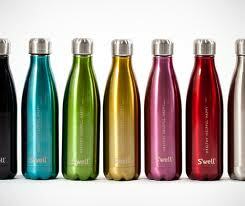 S’well bottles are made of double-layer stainless steel and purport to keep beverages cold for 24 hours or hot for 12. They come in various sizes, but I liked the generous 25 oz one. Plus, the company gives back to clean water charities with every purchase, something I can get behind. But where they really had me was their description of the bottles as being virtually indestructible. That’s a huge plus for someone who routinely leaves a bottle or mug on the car roof and remembers a few miles down the road.